In my London days, I used to take my children to the National Gallery for the Magic Carpet Storytelling sessions for under-5s. The little ones would all walk around the gallery looking for a carpet laid out in front of a painting chosen previously by the story-teller. One time it was Saint George and the Dragon by Paolo Uccello. The lady led the children to the carpet with great drama and proceeded to narrate a fantastic tale involving the knight, the princess he was rescuing and the dragon, all characters in the painting. She also wove in little details about the artist and the techniques he used. It subtly introduced a child to art appreciation and got her interested in all those fabulous paintings in the gallery. Supplementing these sessions are scores of books by the likes of Anna Nilsen, Meredith Hooper, Lucy Micklethwait and Allan Ahlberg. The books are masterpieces themselves and often involve a little child's adventures around the situation of the painting. For example, you have James Mayhew's Katie and the Mona Lisa where little Katie goes to the Louvre and in order to find out what makes the lady smile, climbs into the painting - the book is about their adventures together. I often wondered if one could do similar books around Indian art, the possibilities, after all, are endless. I was totally delighted therefore when a friend told me about Tulika's Looking at Art series. Anjali Raghbeer has authored this set of beautiful books around the lives and works of four contemporary Indian artists. The illustrations have been done by Soumya Menon, an NID grad. Awesome is an understatement. 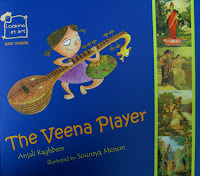 In The Veena Player, little Valsa goes to stay over at her aunt's place. Aunty Prima is a restorer of paintings and Valsa is drawn to a beautiful Ravi Varma painting that her aunt is currently working on. She befriends the lovely lady who is the subject of the painting and eventually helps her out. The reader is treated to a number of Ravi Varma works, all of which are beautifully woven into the story. At the end of the story there is a section titled 'Looking at Ravi Varma's Paintings'. It sketches the artist's life and tells us about his works and their influence on the Indian art scene. It is packed with information easily digestible by young readers. Barefoot Husain is about a schoolboy called Jai who is lost in the art gallery and bumps into someone else who is also lost. He recognizes M.F.Husain and asks him why is looking so sad. Hussain tells him that he has lost his shoes and now cannot attend his show because he had promised his sister that for once he would wear them. Husain conjures up a horse by simply sketching it and Jai jumps on it to hunt out the missing footwear. Read it to accompany them on the rest of their hunt all over the city, all I'll tell you is that the end is the best bit! The 'Looking at Husain's Paintings' part tells us about how the artist started off as a painter of cinema hoardings and takes a look at his style and his vivid creations. 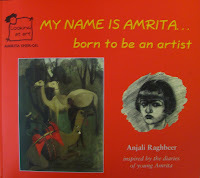 My Name is Amrita.. is about the talented Amrita Sher-Gil. The book is inspired by the diaries of the artist when she was a young girl and indeed reads like one, with pictures taken from a private collection of Sher-Gil's paintings, drawings and photographs. The story gives us a peek into Amrita's privileged childhood and and her blossoming into one of India's foremost painters. The Looking at.. section takes us through the rest of her amazing (albeit short) life. A Trail of Paint takes us on an exciting chase in the streets of Kolkata along with Biswajeet and the old man he bumps into at a Jamini Roy exhibition. Earlier, he had been dragged along with his art-loving aunt and then left on his own for a while. The old man tells Biswajeet that there are fakes in the gallery and shows him how one can spot them. Do they manage to figure out who is creating the frauds? Does the crook get caught? And, who is the old man? Read it and find out! The Looking at.. section tells us about how Roy was hugely influenced by the folk art around him, eventually developing his unique style. It is full of his stunning works including my favourite, The Pujarin. Did you know that he had created about 32,000 paintings in his life?! There is no age group indicated but I think it would appeal to a wide age range and also to grown-ups! My older daughter was fascinated by them and read them over and over. I also found the little one peering at the paintings and later begging me to read the books to her. These are books one will savour again and again and are a definitely a collector's item. The front page of ravi varma's book with the kid trying to pose like the painting of saraswati is very nice and funny! We too have been awaiting this series eagerly, ever since we heard it ! Now your review makes me definitely want to buy it ! How d'you find these?! Amazing, Divya would love these. Breath of fresh air you always bring, Chox! 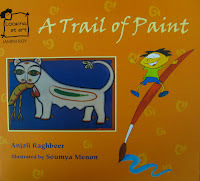 First, pratham's history series and now one on art series. Wow! Will be nice if schools offer children this series on India's artists - as part of art and drawing in the classroom curriculum. Will check them out for sure. Thanks! WOW, I am drooling. I couldn't see pics in the sneak peak, so I was waiting for the post to be up. Seriously. I remember the Ravi Verma Saraswathi and Lakshmi in my grandma's house. Grew up looking at those paintings. Absolutely adore his Maharashtrian Lady and The Milkmaid. Can't wait to lay my hands on this series. Thanks for bringing this to us Chox! I will defly pick them up, to educate myself and my daughter. Truly wonderful. A wonderful set of books. Can't wait to lay my hands on them. Looks like it would please kids of all ages. Great find! Thanks! Wow Chox. This is terribly exciting. I loved the idea of MF Hussain conjuring up a horse by painting it and the boy jumping on to find the shoes. How inventive!! I don't have a wishlist of Indian books as such, but this is going on it. Thanks for such a succint look at the series. Awesome, Chox! What a wonderful way to incorporate art into our kids' lives! Loved your intro about story-telling mingling with art appreciation - they do go well together to make a lasting impression... Thanks! Thanks everyone. The books *will* make anyone go into an extremely excited mode! Praba - thats a wonderful idea! @starry: The friend I mentioned got them for us. Let me know if you want them as well. Maha interesting, am really excited by there books too! Will definitely get hold of them. We love this book. My older one totally digs it. Poppy: Did you get them yet?! What did the Poppins think of ‘em?! utbt: Why am I not surprised?! P: Your comment itself is a perfect review of the books. Come to Bengalooru, the NGMA here has a roomful of Sher-Gill’s works, some of which have been featured in Raghbeer’s book. On a recent trip to the Salar Jung museum, my 5-year old spotted a Ravi Varma and excitedly identified it, thanks to Tulika’s The Veena Player. Hats off to the Tulika team for getting even little ones interested in the stuff. We love love "a trail of paint"! Both mom and child are in awe, with the child reaching for this one from the shelf, often! The book is informative, and with just the right things to keep the little one interested, its wonderful! Thank you R & S for this book, and chox for bringing it to ST!